Design Team: GFF, inc. and Purdy-McGuire, inc. Built in 1902 for the Brown Cracker & Candy Co. "the largest bakers of crackers and fancy confections in the Southwest." It's amazing how a structure can be transformed over time, in this case over 100 years. 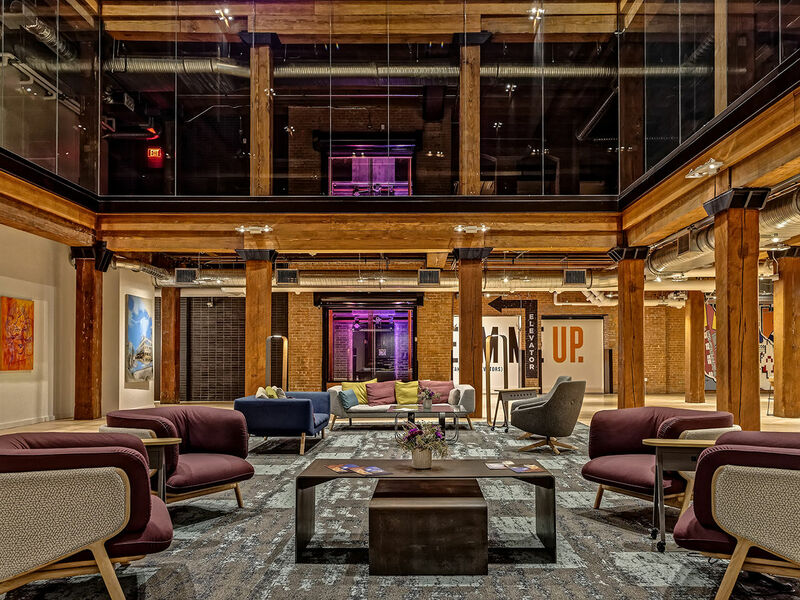 From a cracker factory, housing over 1,000 employees and giant ovens; to a movie theater, Planet Hollywood, indoor mall and arcade; to almost 10 years as a vacant structure, this historic structure now has new life as trendy office spaces. 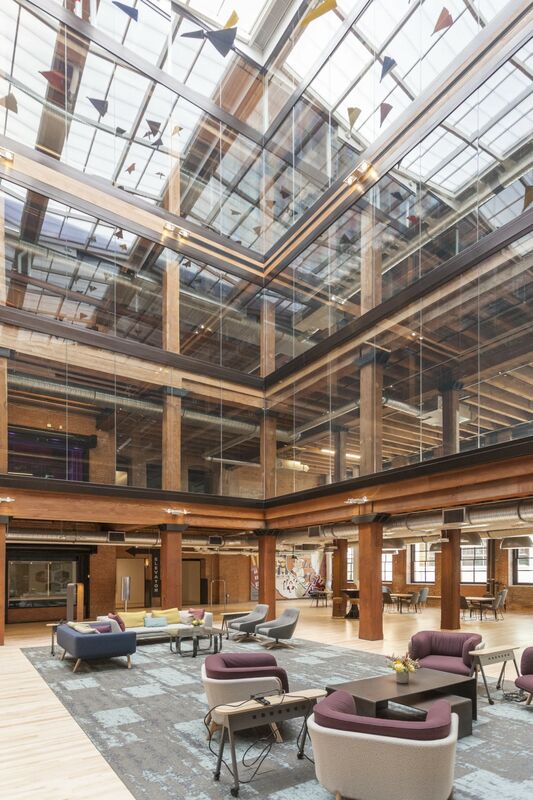 Finished with a huge atrium and an added amenity floor enclosed in glass, it provides a unique work environment. Restaurants are soon to come for the ground level. 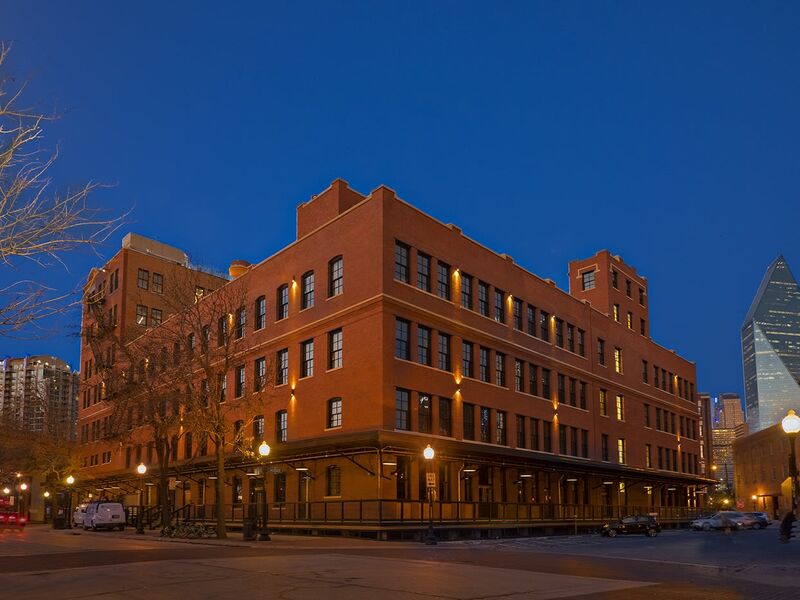 The project was an exercise in preservation and transformation. 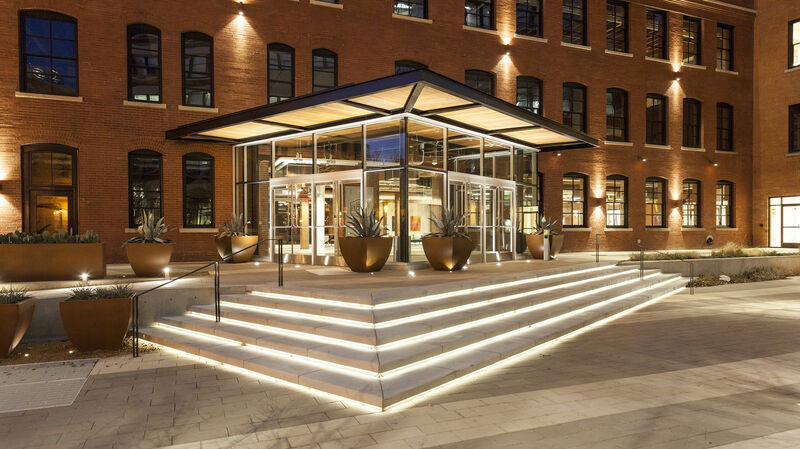 The project was rehabilitated within all requirements of the Dallas West End Historic District, it now serves as office space artfully combining the historic structure with contemporary infrastructure. 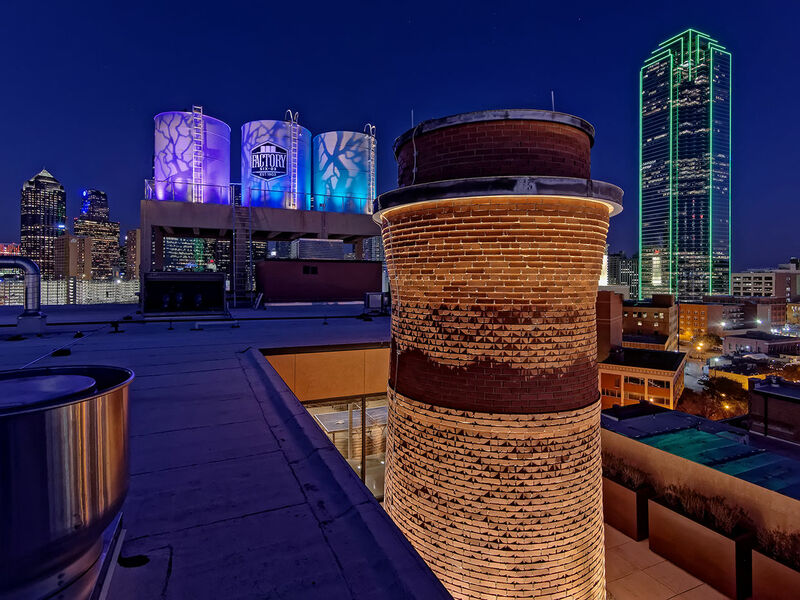 From the care to restore the large wood support columns throughout, to the three iconic water tanks at the rooftop, we wanted to celebrate details. 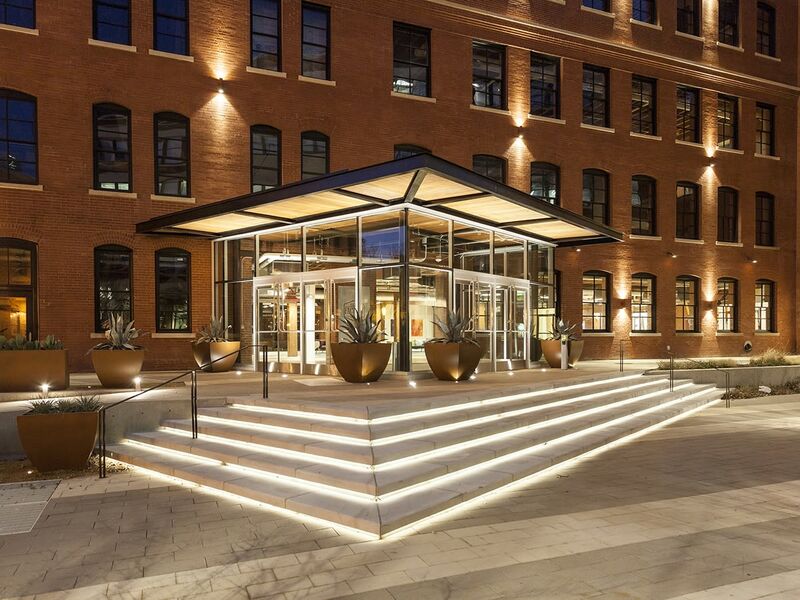 Pictured above, the new entry vestibule is a jewel-like glass box, appearing to float away from the building with uplights carefully placed both inside and out. Dimmable LED linear fixtures detailed under stair treads illuminate the building stair plinth for safety. A top level amenity deck with stunning views across downtown and vistas South is simply lit with surface mount accents and large decorative pendants. 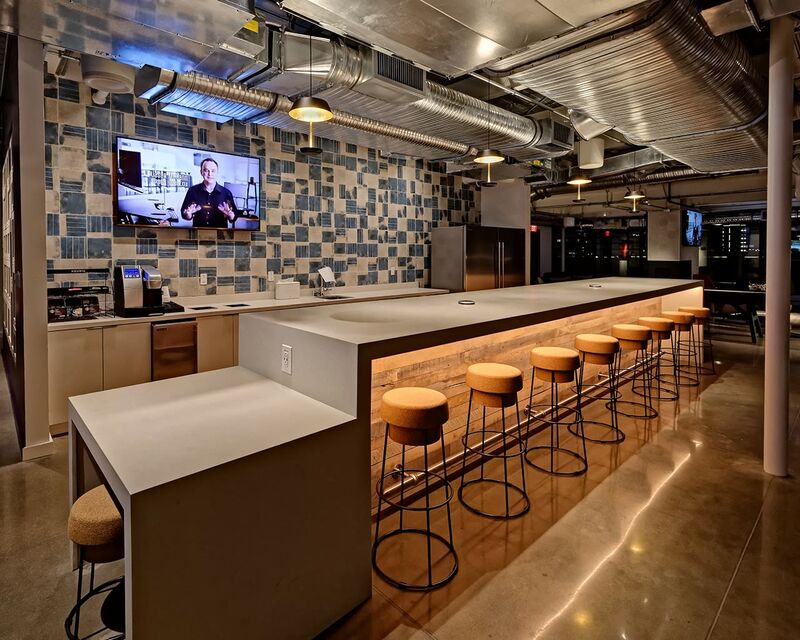 Fixture selections were important to reinforce the polished industrial feel of the interior design while being simple and inexpensive. In both locations large decorative fixtures capture attention. 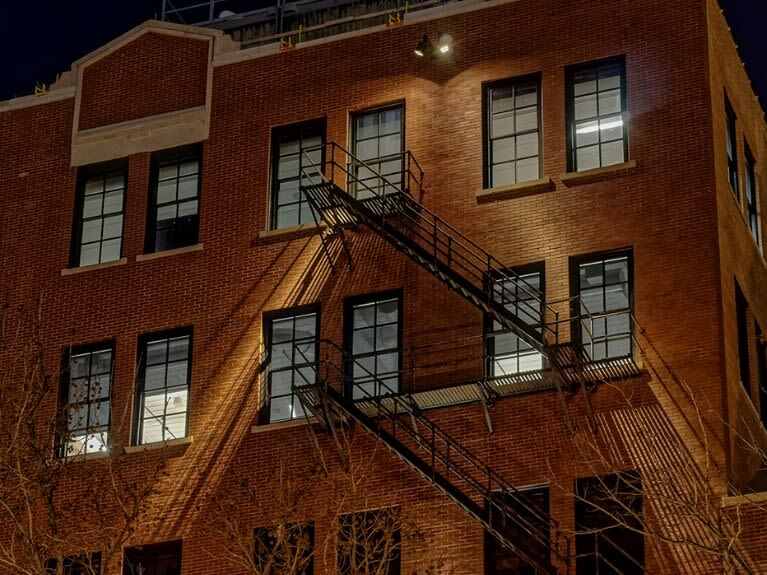 A historic feature of the building facade, special fixtures were located to scatter interesting shadows across the facade from the existing fire escape platforms. 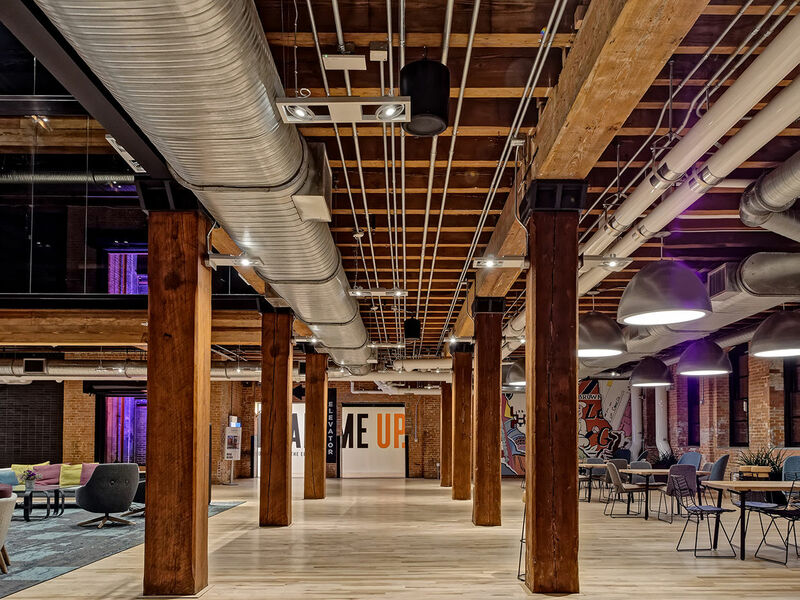 On level 1, column-mounted lighting is exposed, highlighting the structure, yet minimal in style and with finishes that integrate with the applied systems, being intentional about what is new versus what is original to the building. 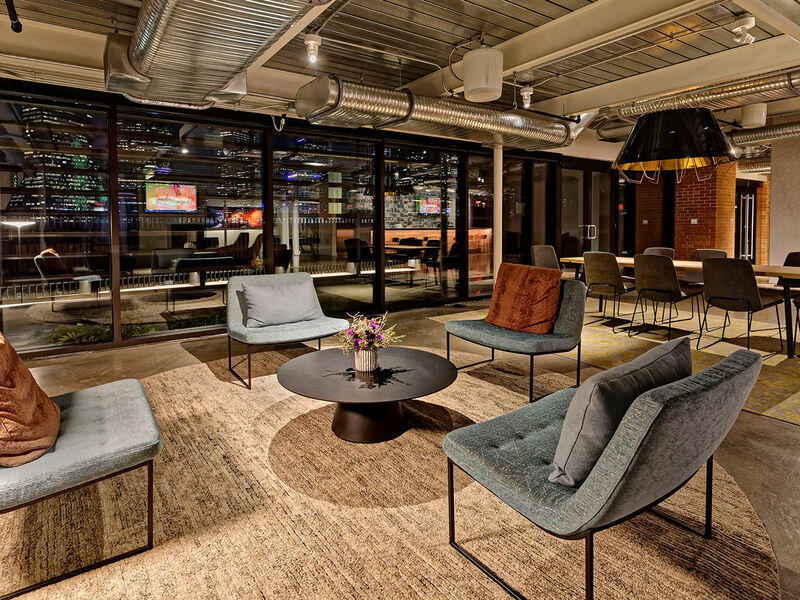 The atrium delivers copious daylight to the interior of these large floor plates by day, and a moody lounge feel by night. 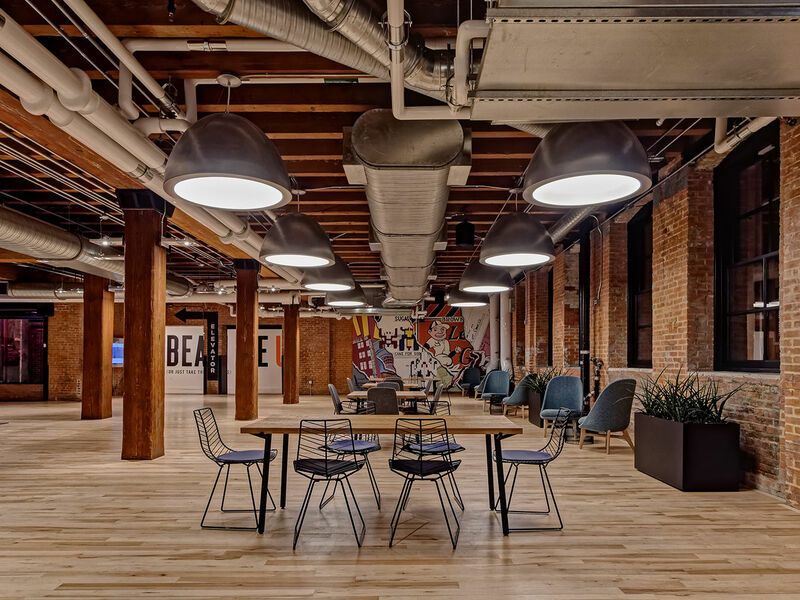 Luminaires were selected to integrate with, yet also highlight, the wood construction - support columns, beams, and original hardwood floors. RGBW fixtures sitting atop the elevator cab and deep in the elevator pit highlight the feature elevator shaft visible on each floor. 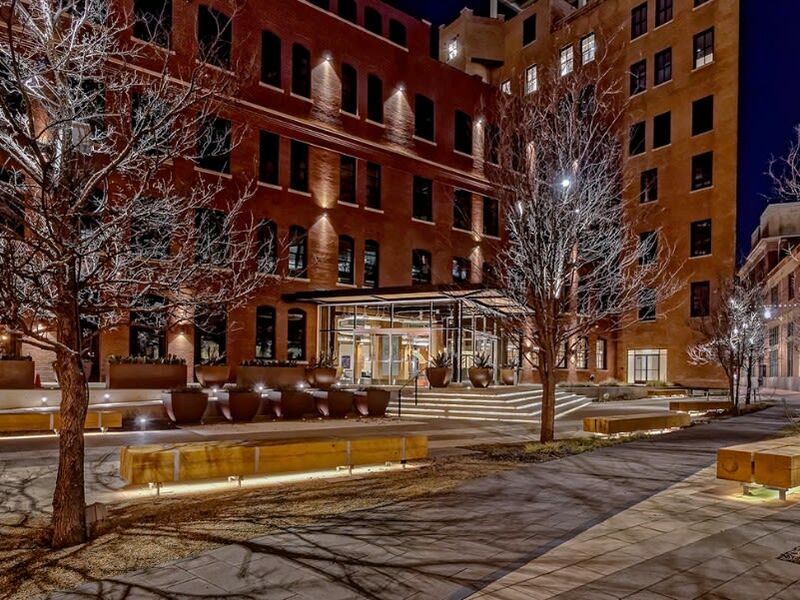 The updated plaza and alley lighting schemes provide an inviting and safe environment for the public in this once dark and dangerous area. 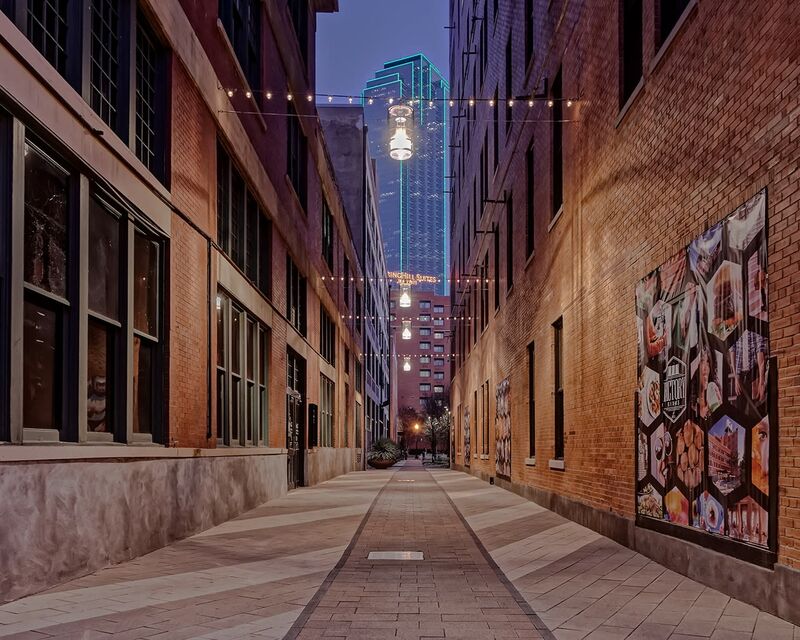 The client is happy with an in-budget, transformative project that is turning heads towards this historic district. 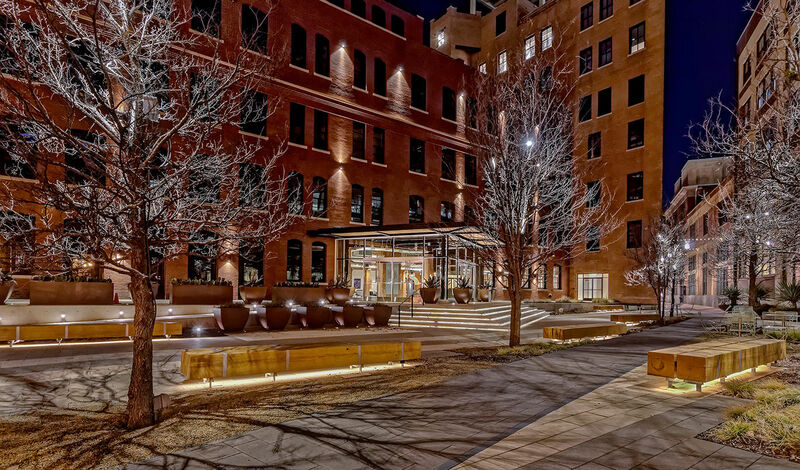 The updated plaza includes dappled tree lighting, under bench glow, and market/catenary fixtures in the old Dallas Alley. And on the rooftop, we explored everything from wrapping the tanks in media mesh, to artfully poking holes and lighting from within them. Both the Historic Preservation Board requirement for restraint, and modest budget turned us towards simple exterior gobo projectors, color-changing floods, and tight accents to highlight the ladders on the iconic water tanks. Two different color temperatures were used to create a dynamic detail to the ladders. A soft color fade tells the story of seasons, events and holidays. In the wee hours the gobos and color turn off and just allow the ladders to be illuminated. Grazing light of the smokestack is visible from nearby areas of town, harkening back to the original ovens housed in this historic and now iconic building.